Only Glencoe has the best solutions for todays language arts curriculum! Writer's Choice: Grammar and Composition, Grade 12, is an integrated language arts program that keeps pace with the current trends in the teaching of writing and related communication skills. Features in both the Student and Teacher Editions build on a solid foundation of instruction including easy-to-understand explanations, clear-cut definitions, real-world examples, and skill-based assessment. The visuals and graphics throughout the textbook engage students' attention and illustrate key concepts and processes. 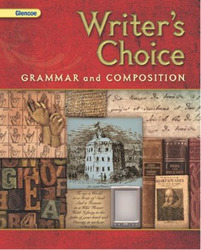 Writer's Choice provides you and your students with the tools for developing skills in writing, reading, researching, speaking, listening, critical thinking, and viewing and representing.